The first step in learning how to work your lower leg! I think the lower leg is a problem area for many riders. I know many people think their lower leg has a mind of its own. You think your riding in good alignment with your heels down and your instructor is asking why it’s pushed forward with your toes pointing down! Or you are trying your best to keep it in line and it just keeps shooting out from under you. The first step in fixing your lower leg is increasing your awareness of it. I know you are thinking-“I’m aware I have a lower leg Nicola!” I don’t mean awareness of its existence, I mean awareness of all of its movements and being in complete control of it. This needs to be done before we even begin any form of corrective exercise work that may be required and you will be pleased to know this process is relatively simple and painless. We are going to start with the feet. Just rolling the bottom of your feet on a ball whether that be just a tennis ball or a spiky physio ball stimulates the nerve endings and brings more awareness to the area. It also has the added benefit of releasing tension and relaxing the surrounding muscles. On horse I want you to try out this simple exercise. As you are riding around just at a walk, with your feet in the stirrups as normal take your awareness to your feet. Can you feel each of your toes if you try to move them? Can you move the weight from your big toe to your little toe, then maybe the middle toes and finally try to take the weight evenly across all of your toes? How do your feet feel in the stirrups now? Does moving your toes around change the angle of your foot and/or leg? I’m not going to tell you what should or shouldn’t happen as we are all different and you may experience this different to your friend. I just want you to bring your awareness to your feet and practice moving the weight around in your toes as this is a really helpful step in improving your lower leg. There are two spaces available in my Tuesday evening Class at 7.30pm and 1 space available in my Thursday evening class at 7.30pm. Both are held at my studio at WN8 9QP. Let me know if you would like to join us, everyone that has joined us so far is already feeling the difference in their riding. 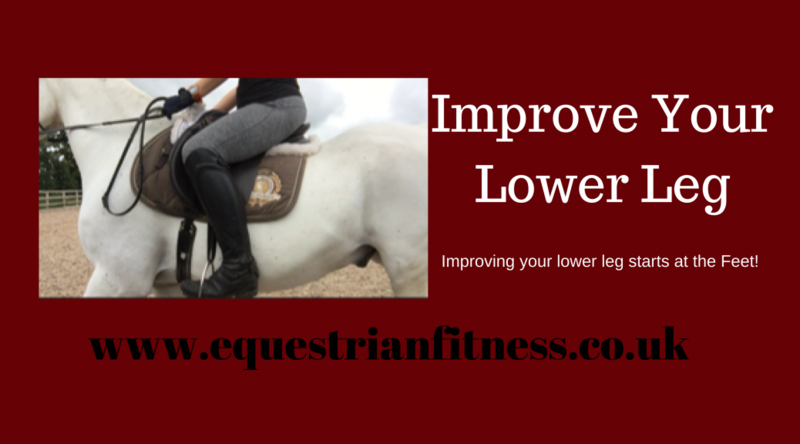 So last week we talked about improving the canter and we discussed the QL muscle. QL is a muscle of the back that is involved in both front to back stability as well as lateral stability. In simple terms it keeps your torso in balance. This was discussed in last weeks blog about how we need to keep stable through the whole of our torso in order to Canter effectively –without bumping and/or sliding. 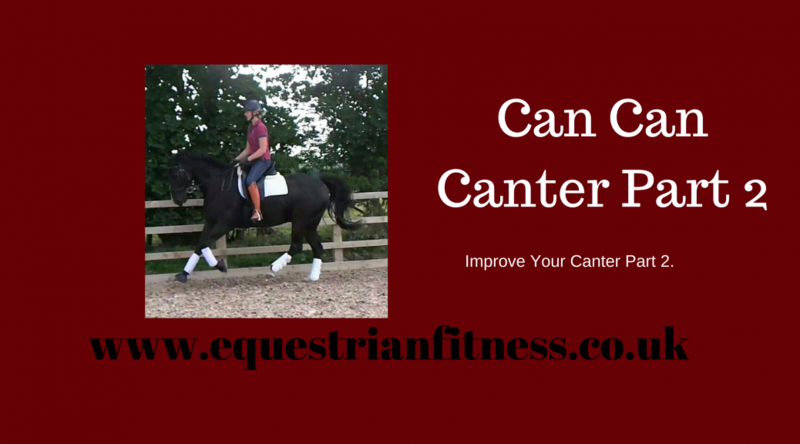 Hopefully if you have issues with your canter you have been trying the QL releases that I took you through last week. Now we are going to start strengthening this area. First a little test of its current strength -Side plank. This is commonly done as a core exercise and indeed your QL is vital for core strength. The QL underneath will be fighting gravity to hold you up. How long can you hold a side plank for? If you feel this in your shoulder you are not using your QL to hold you up-probably suggesting it isn't strong enough yet. Then move onto this Side Plank Dips to help strengthen it. 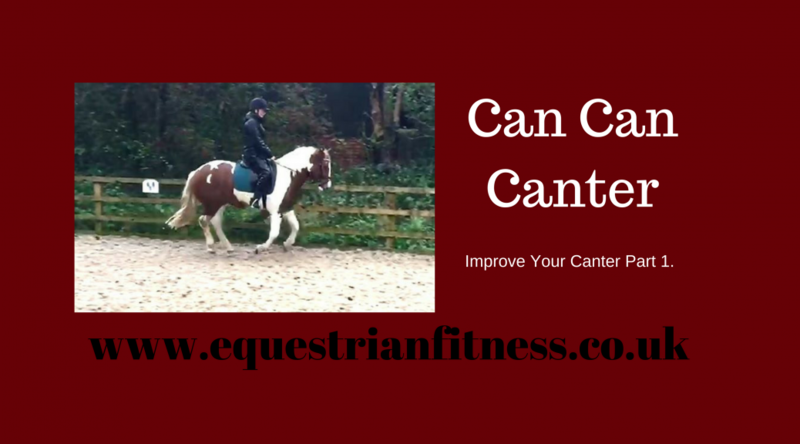 I have been asked a couple of times on social media if I can write about improving the canter. As I think it is safe to say that most riders have a better trot than canter. So, let’s look at the canter from the horses’ point of view. It is a 3 beat gait that starts with the outside hind leg pushing off, the second beat is the inside hind and outside fore finishing with the inside fore (which is the “leading”leg). This creates the rocking motion of back leg to front leg which we can find difficult to sit to. The power of the canter comes from the back of the horse in particular that outside hind leg that creates the first beat. Riders scoop their tailbone under and lean back causing them to rock with the horse, which may create the feeling of pushing the canter along. They may have been taught to “polish the saddle” as children but unfortunately for most people this takes them out of neutral spine; which in turn makes them less able to absorb the force of the canter and has them swept along for two beats then bumped back at beat 3-starts polishing again……..
Or alternatively riders lean forward slightly which causes the tailbone to bump the saddle. These riders may be always hunched or to help absorb the canter they want to activate their core so essentially do an on horse ab crunch to help them stay stable. Ideally we want to remain neutral in the saddle, other than a small hip hinge at beat one which emphasises the take-off from the outside hind. In order for this to happen we need to activate muscles in both the front and the back of the torso. and I have also covered an introduction to general low back exercise which will also help with this. However in particular I want to look at a muscle in the back called Quadratus Lomborum (swish your wand as you say it!) or for short QL. The reason I want to look at QL is that it is not just an integral part of good back function and therefore overall core but it is also implicated in your pelvis both its position and its function. QL attaches from the ribs, down the spine to the back of the pelvis. It is because of these attachments that if it becomes shortened it can tilt the pelvis forward (your bum sticks out) or it if becomes too long (due to weakness) it will be also difficult to maintain a neutral pelvis as your bum will want to scoop under. In order to maintain a neutral spine this muscle must be strong and supple. Also strength in this area encourages further hip stability as it has been shown that any dysfunction in one side of the QL shows a dysfunction in the opposite Glute Medius (I.E. Left QL Right GM). I have previously mentioned Glute Medius as being a key player in stable hips. In order to promote good function in this area firstly we are going to look at releasing any inhibited QL and also Glute Medius. Next week we are going to look at strengthening the QL Muscle. I want you to think about you and your horse as an electrical circuit. The lights only come on if the circuit is complete. Or if there is a weak link in the circuit the light may come on but it may be flickering. Your partnership only performs at its best if the circuit is complete. 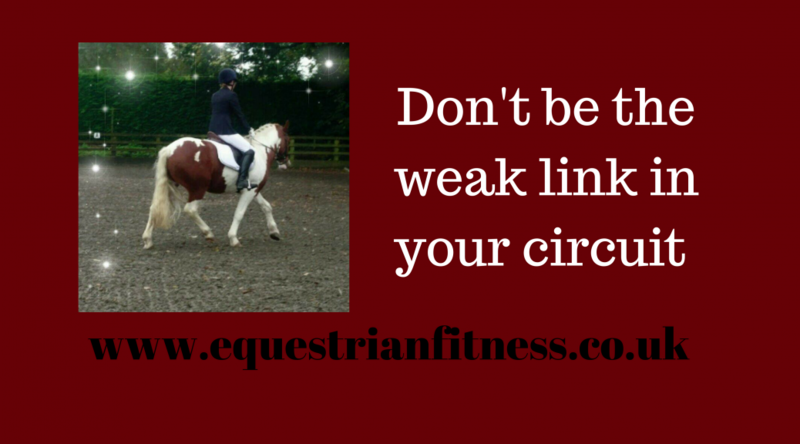 If there is a weak link somewhere in the circuit it is not as powerful-or it doesn’t perform at all. This is why I focus on the rider element of this partnership. You could be sat on the perfect athlete of a horse but if you are not a capable athlete yourself the circuit will not be complete and you will not perform at your best as a partnership. There are some great trainers etc. that can work on your horse as the athlete and also help to train you to work together as a partnership, but for that to really happen you also need to work on you. Essentially your horse is a complete circuit and he needs to be performing well from head to hoof for him to create a full circuit and switch the lights on. You are also a circuit and in order to switch the lights on within you, you also need to be performing as best you can from head to toe. This is where your fitness comes in. Now I’ve said before I don’t believe that all riders need to be pounding the treadmill and lifting heavy weights in order to be fit to ride. However I do think we need to have our best function possible throughout our body. How does your body feel generally day to day? Do you feel tired, stiff or weak? Or do you feel energetic, mobile and strong? Can you balance equally on your left leg compared to your right? Can you move your arms around without hunching your shoulders? I believe the most important things a rider can focus on are being both mobile and stable throughout their body. If for example you have greatly efficient legs and a strong core but unstable shoulders that creates a weak link in your circuit. If your horse is overall performing really well except that they are tight in the left shoulder this creates a weak link in the circuit. Equally when you and your horse combine to create your partnership circuit only one of these weaknesses needs to be present to have a weak link in the circuit. So, I just want you to think about you as a circuit, look for the weak links and learn how you can improve them. If you need any help with this I offer Rider Biomechanics Assessments, 1 2 1 Training and Sports Massage at my Studio so hit reply if you would like to work with me.